Baba Salah: A Malian Musician Speaks To His Nation's Displaced The guitarist comes from the northern city of Gao, which has made headlines lately due to fighting by Islamist militants and French-backed Malian forces. Salah now plays at a club in Mali's capital, Bamako, where, he says, people gather to relax, reminisce and "see images other than war." Baba Salah at his home in Bamako, Mali. On his new album, Dangay, he calls attention to what he describes as human-rights violations in the north. It's Friday night in Bamako, and a club in the Malian capital has come alive. Guitarist and singer Baba Salah is on the floor. His hometown of Gao, along the banks of the River Niger on the fringes of the Sahara Desert, made headlines as the first city in the north to be liberated by French-backed Malian forces in January. Gao was one of three regional centers in the north captured by rebels and jihadis a year ago. Islamists warned musicians that their tongues would be sliced out if they continued to sing and play. Speaking in French, Salah says artists left in a hurry. "When we heard and witnessed musical instruments being burned in Gao, we realized the threats against us were dead serious," Salah says. "So all the musicians vamoosed. It's as if part of our own culture was taken hostage." They say Mali without music is a country without a soul. 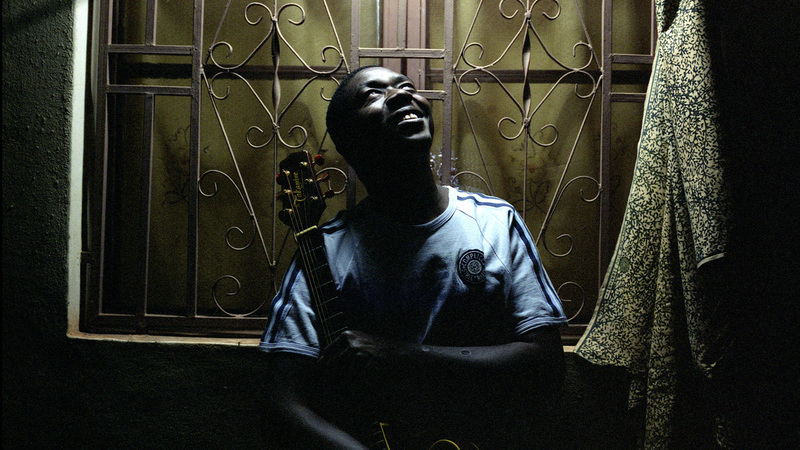 "I ask myself if Mali can exist without music," Salah says. "Everything important in Mali is linked to music. Where I come from in the north, in our society, births, baptisms, naming and circumcision ceremonies, marriages — all are accompanied by music." Baba Salah was in the studio, putting the finishing touches on his latest album, when Mali fell apart last year. He decided to call the new recording Dangay, which means "the north" in his Songhai language. The album, in part, sounds the alarm about the problems in his northern home region and what Salah describes as human-rights violations by the Islamist fighters who occupied a desert zone, the size of Texas, a year ago. "What I'm saying in the album Dangay is, above all, that people must pay attention to what's been happening in the north regarding human-rights abuses and punishments," Salah says. "The world must not close its eyes and block its ears to what's been going on during the occupation of northern Mali." The new album features songs about love, but also about social issues like child labor, the environment and farming — as in the track "Fari," which means "agriculture." "You know, agriculture is the ideal engine for development in Africa," Salah says. "Mali is an influential country in West Africa, and I believe that when Mali rises up again, we will be an example for West Africa, as we were during our struggle for democracy. We have to develop our continent." "Fari," performed live by Baba Salah and his band, has the patrons swaying and clapping on the dance floor at the club where he plays every Friday night. His fellow northerners gather to reminisce, relax, let off steam, exchange stories and enjoy the music. Salah says southerners do too, and it's a weekly date he simply can't miss. "People laugh, they dance," Salah says. "For the three or four hours that we're playing, you forget everything and everyone becomes your brother. You see images other than war." Salah says it warms his heart, and that he remains hopeful that Mali will come out right in the end. "Music has a spiritual power to heal. It has a profound ability to overcome perhaps every hurdle," he says. "Maybe people are angry right now, and it's difficult to control some of them. But we condemn retaliation against anyone. We are all Malians; we are all brothers. If anyone has anything to say, let them put it on the table and make peace through dialogue."